The goal is to maximize decision-making, enhance customer options and insert efficiencies into every transaction, using what XPO says are sophisticated technologies. XPO, the largest 3PL in North America, said it has been investing at least $400 million a year in technology since 2017. That number is expected to be $550 million in 2019. The company says it has 1,700 technology specialists focused on four areas of innovation: automation and intelligent machines, visibility and customer service, the digital freight marketplace and data science. The company, based in Greenwich, Conn., has a European headquarters in Lyon, France. In Europe, the company will launch a freight marketplace, a digital platform that will match supply with demand across the company’s transportation systems, according to a company news release. The platform, known as XPO Connect, has virtual tools for buying and selling capacity, and lets customers track their freight. The system also uses “machine learning” to counter or accept bids for freight. XPO introduced XPO Connect in North America in 2018. XPO officials said the Connect platform is unique in the industry because it uses a combination of multimodal architecture, machine learning and the company’s predictive analytics. Customers have visibility into freight movements, including geolocation, weather conditions, traffic and other factors relevant to shipment status, according to XPO. The company also will be targeting warehouses for technological upgrades. On March 12, XPO announced another tech system, XPO Smart, intended for labor productivity. Company officials said the system and its tools have been deployed in 20 logistics facilities, including customer warehouses and hubs for XPO Direct, its shared-space distribution network. Approximately 200 implementations are planned by year-end, XPO officials said in the news release. The labor productivity system puts warehouse operations under what XPO calls a “technological microscope,” providing managers with data at different levels, from total facility output to the productivity of individual workers and teams. The XPO software analyzes three key factors: labor output, including gaps that need resolution; fast-moving inventory stock keeping units for best placement within the warehouse; and outbound production measured against on-time targets, according to the company. Harik said the labor software uses algorithms and site-specific machine learning to determine how individual output contributes to XPO’s goals. The system can spot inefficiencies “very quickly,” Harik said, reducing costs and improving fulfillment speed. 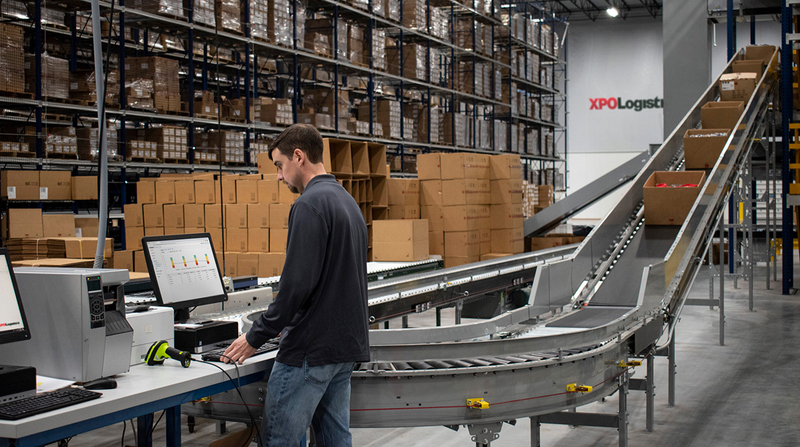 XPO officials said the labor productivity system connects with the company’s warehouse management system and third-party workforce management applications. The system delivers data through a single dashboard, using machine learning to predict how a decision in one area will affect total operations, the company said. Thus, managers gain “deep visibility” into workforce operations, according to XPO officials. Harik said XPO’s proprietary algorithms turn data into relevant information that managers and workers can use in seconds, enhancing decision-making. The technology will benefit the supply chains, he said. XPO Logistics ranks No. 1 on the Transport Topics Top 50 list of the largest logistics companies in North America.